Annmarie McKeon Keating passed away peacefully at home surrounded by her loving family on St. Patrick’s Day. She was born in Troy, NY, the only daughter of William B. McKeon, MD, and Anna Mahoney McKeon. She was a graduate of the Convent of the Sacred Heart High School. It was there that she received the coveted Child of Mary medal that she wore faithfully her entire life in recognition of her scholastic achievements and service to others. She then went to St. Rose College, NY, where she graduated with a B.S. Nursing. While in college, she met her future husband. They would walk hand in hand for the next sixty three years. Mom and Dad raised seven children – six boys and one special girl who was the answer to many years of prayer. Amidst the loudness and testosterone, Mom was somehow able to lovingly guide each one of us into becoming people who in their own way, were going to make the “world be a better place”. She taught us what grace, gentleness, and firmness looked like, while being a Mom, wife and “a lady”. We learned that each person was special. If you came into our house, you were treated like royalty. Mom saw herself as a person with a special talent for “canning” and needlepoint. But, her children remember her as a gourmet chef who managed “the kitchen” on a shoestring budget. We ate dinner together every night and talked about the day. Inevitably, this led to politics (and there was only one right answer). Mom valued the importance of education and faith. This taught us “how” to be successful in life, and, “why” we were placed here. We grew up hearing, “God only helps those who help themselves”, which was followed by, “you can do anything, if you only set your mind on it”. She always expected our best (actually, demanded it), but, was there whenever this was not enough. Over the years, we all learned that it is “the God” part that was most important; and as we learned, “He would direct our paths”. Mom was happiest when surrounded by her family and friends. As our family grew, Mom continued to touch the next generation. She cherished time with each of her grandchildren and mastered the art of emoji’s. Only Mom could find a way to get around her children to reach her grandchildren. Mom had reached the ultimate pinnacle of “Cool Grandma”. There is much to share, and we all have our own special memories with Mom. But, most importantly on this day, we all know Mom loved us, and we really loved her. We will miss her very much and will strive to carry on the legacy started by Mom. In honor of Mom, the children are willing to share one of her most requested recipes; but, you must come to the funeral service to receive it. 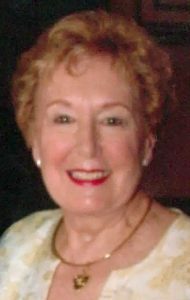 She is survived by her loving husband, Joe Keating, and her seven children: William J. Keating, MD (Sharon); Michael P. Keating; Rev. Edward J. Keating, Jr; Thomas J. Keating (deceased); Mark M. Keating (Alison); Peter J. Keating (Eileen); Annmarie M. Hyrb (Chris); and Daniel P. Keating; and, sixteen grandchildren and two great grandchildren. A Mass of Christian Burial will be held at 11 a.m. on Friday, March 22, 2019, at St. Leo the Great Catholic Church, 2427 Marietta Ave., Lancaster, Pa. with Rev. Edward J, Keating as celebrant. Interment will be private at St. Joseph New Catholic Cemetery. Family and friends will be received from 9:30 a.m.-11 a.m. at the church. In place of flowers, contributions in Annmarie’s memory may be made to the Seven Sorrows of the Blessed Virgin Mary Church, 280 N. Race Street, Middletown PA 17057. Our love and prayers walk with you all and so sorry that we just learned of Annmarie’s passing and are so saddened . Annmarie was and will always be such a shining beacon of love in our family and will miss her very much. She will be remembered always in our love and prayers!! Love and Peace, Bill and Mary Ellen Rogers. I am from Seven Sorrows, Middletown and it has been a great pleasure to know Father Ted as we call him. I did not know his family but to raise such a wonderful caring man says a lot about the parents. Annmarie did a great job and can RIP knowing that. Prayers sent to the family. We were saddened to hear of Annmarie’s passing. She was always so gracious and kind to us. We loved her smiling and cheerful personality and the way she brightened any room she entered. We will surely miss her. Unfortunately, we will not be able to be with you at this time because we are in the middle of a three week tour of Sicily. However, we hope our prayers and support will comfort you. I first met the Keatings when Bill was our paperboy (many years ago). I knew then what a lovely family they were. I remember the exitement when little Mia was born. I will certainly miss seeing her at Sunday brunch. My love and prayers to you all. My sincere sympathy and prayers to the Keating family and especially my dear friend Father Ted. The obituary was a beautiful tribute to a wonderful lady, mother and wife. It’s been many years since I visited the Keating family but you always made me feel like family. Your mother was obviously a great inspiration to all of you and she is in good hands now. Vince F.
I had the pleasure of knowing Annemarie when she was a private duty nurse at Homestead Village. She was very gentle, kind and professional. You have my deepest sympathy and my prayers that you may receive peace in the days to come. Hello: I am not a friend or relative, but my last name is Keating, so I could not help but read Annmarie’s obit this morning in LNP. I wish I had known her. Her obit was a wonderful story. Sometimes (actually, most times) it’s great to be a Keating. I had the pleasure of meeting Mrs. Keating on several occasions, what a beautiful, caring lady. She will be missed by so many of us. Prayers and sympathy to her familly. On behalf of Peter’s clients in Shamokin, PA, we extend our deepest sympathy to the family of Mrs. Keating.